Full details on the 2017 workshop series are on the Djerassi site. The Extended Now is a special residential workshop from June 10th to June 15th, 2017 at Djerassi Resident Artist Program. It explores technical and compositional strategies for integrating live and interactive media in the composition of site-specific installation and performance along with an intensive course in the use of Isadora and related software / sensors. 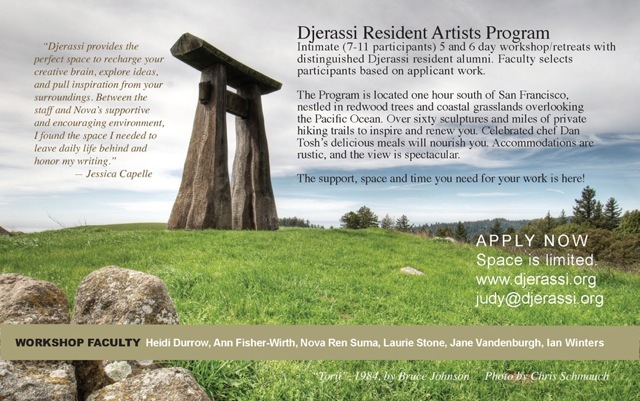 part of the Djerassi’s 2017 workshop series. Geared toward performance makers, visual artists and musicians interested in exploring new media tools, the Extended Now workshop with Ian Winters explores technical and compositional strategies for integrating live and interactive media in performance and site-specific installation, and investigate the political implications of technology use in the contemporary performance landscape. Our time is split between the development of technical skills and creating short site-specific interventions, installations and performances, culminating in a Sunday evening workshop performance for students and invited guests. The technical aspects of the workshop focus on the use of Isadora as a software tool to easily integrate recorded & live visual imagery / video, lighting, sound and sensor information as core parts of physical performance, dance and installations. Depending on student interest / needs we may also work with Max/MSP, Processing, and the creation of simple physical electronics and sensor driven performance using Arduino. Included as a part of the workshop will be a private consultation with Ian to review your project. On the compositional side a few questions / thoughts inform the workshop: How long is now? What happens when the now of performance is extended through image, sound, light, and repetition / amplification / contrast? What does interaction mean in a sensor-driven world and where does the ‘interaction’ occur? How can these tools extend choreography beyond the body to ideas of attention and experience? What kinds of compositional strategies / tools / scores can be used to work across divergent media? Where is the body in all of this? What is the lowest tech way to proceed? Workshop fees: $1000 private room w shared bath; $1250 private room and bath. Includes all lodging, all food, and local transportation from and to the San Francisco Airport. Also included are use of workshop equipment (see below), a workshop software license and professional documentation of the workshop showing. or by clicking on the APPLY button on the top left of this page. • A work-sample: two video links of recent work or up to 6 stills if video is not available. The creative possibilities at the intersections of visual & sonic media, physical performance, and installation have been transformed over the past ten years by the explosion of inexpensive sensors, control software, and live processing. The Extended Now workshop explores how to meaningfully integrate those possibilities into the compositional process through a combination of hands-on practical skills, and making your own short installations and performances on-site in the fantastic Djerassi landscape. Participants will arrive with ideas for a specific project they would like to create on-site at Djerassi and detailed before hand in a one to two paragraph description. The workshop time will be split between the development of technical skills with an emphasis on how to use live video / sound / sensors with Isadora and using that knowledge to create short site-specific interventions in and around the Djerassi landscape and buildings. Each day will be split between a skills workshop, work / compositional time, and sharing work. Sunday evening culminates with a private showing of work by participants for a small number of invited friends and family. We will be having the final Sunday evening showing professionally documented so that participants can all leave with a solid record of their accomplishments to aid in further developing their projects. • Setting up more complex patches and data structures and sharing data between other programs such as Abelton Live, Processing sketches, Q-lab, etc. In addition, we will be building a few simple, cheap physical computing tools such as touch and motion sensors to help demystify the world of hardware. Other key elements include working with projectors, cameras, and audio interfaces. Suggested background: professional or advanced undergraduate background in performance/dance/theater, visual/media art, video or sound. No programming experience is required. Required equipment: a computer capable of running Isadora, Max/MSP or Processing. Suggested equipment: a camera, sound recorder, any special tools you want to work with. The time I’ve spent at residencies and intensive workshops have been some of the productive and inspired periods of my creative life. Djerassi offers a truly unique opportunity to work in fantastic natural surroundings with no distractions beyond your work itself. The opportunity to teach in this environment is an incredibly special gift I’m delighted to share with workshop participants. “I have know Ian for more than 10 years and have worked with him as a collaborator on many projects that interface Lighting Design and Video Installation. I have also worked with Ian on my own Large scale Video Installations that require a level of expertise far surpassing my own ability. Ian is an incredibly knowledgeable and inspiring person to wrk with both technically and aesthetically. Over the years I have had him visit several of my seminars at Mass Art in Boston in the Studio for Interrelated Media. Ian Winters is an award winning video & media artist working at the intersections of physical performance, installations / architectural form, and time-based media based in the San Francisco Bay Area. In addition to individual work he often collaborates with composers, directors, and choreographers to create both staged and site-specific media environments through performance, visual and acoustic media. Recent awards include Creative Work Fund, Rainin and Zellerbach foundation funding, residencies at Djerassi, Sussex University, and Earthdance, 2013 and 2014 ISEA panelist on sensor driven and network performance, Leonardo LASER presentations, 2012 & 2014 LAD awards for video design, and 2012,13,14 Isadora Duncan Award nominations for best visual design. In addition he teaches workshops in interactive video / sound, and has been a visiting artist / conference presenter in media & performance at many institutions including USF, SF State, MIT, Mass Art, LSU, Amherst, Duke, Brighton, Sussex, CCA & Brunel. He studied video, performance and photography at the SMFA-Boston and Tufts University, with post- graduate training in architecture and live performance. Recent video and media design collaborations include work with Myra Melford, Robert Moses Kin, Francis Ford Coppola, Shotgun Players, ALICE Arts, Chitresh Das, Pamela Z, Mary Armentrout Dance Theater, Shadowlight Puppet Theater, Makrokosma Bali/Gamelan Sekar Jaya, DSDT, ODC Dance, Lenora Lee Dance, ALICE Arts, Evelyn Ficarra and many others. His work (either solo or as a video/media designer) has been seen at many venues including Yerba Buena Center for the Arts, Zero-1 Gallery, ODC, Z-Space, The Asian Art Museum, Center for New Music-SF, The Kitchen, EMPAC, London City University, the Port of Oakland, Attenborough Centre for the Arts (Sussex University), The Luggage Store, Moscow Conservatory Electro-acoustic Center, Journées de l’électroacoustique: Paris, Mass Art, London Cutting Edge Festival, OPEN Cinema Festival (RU), CounterPULSE, CNMAT, Highways, 21 Grand, Shotgun Players, The Magic, Luckman Center for Arts (LA).